Show someone how special they are using your creativity. A reader needs some advice. I received an email request today. One that has my craft starved brain a bit more addled than normal. The request is about a cutting device. Read the letter below and let’s see if this awesome crafting community can come to the aid of another crafter. But I like to make mosaics with pieces left over from die cuts, and fussy cutting my alcohol ink papers. 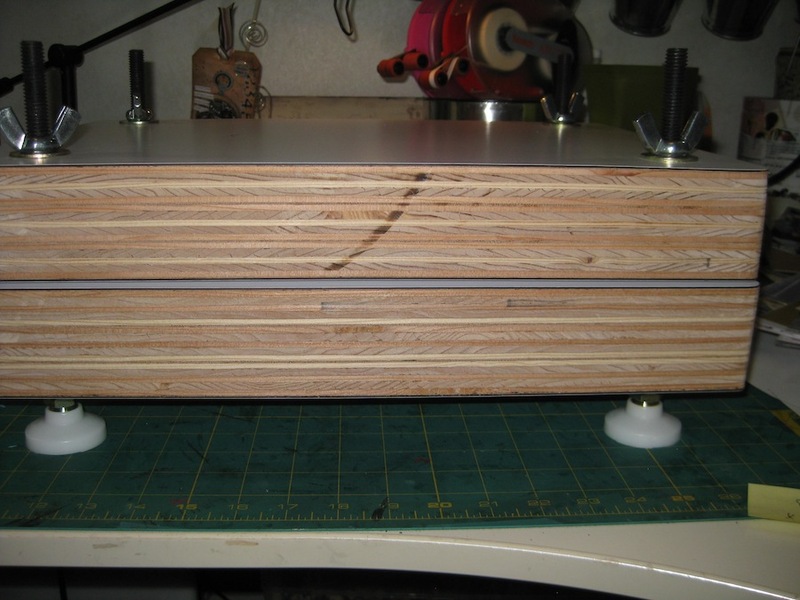 I need something that will allow me to make right angle (or see if I am at right angle, or parallel)… but something that will handle small pieces. Sometimes I go as small as 1/4 “, when I do that I usually get out my scissors and a pen. Anyway, if you can help I’d appreciate it! I’ve emailed Lee with my suggestion of making Serendipity Squares if all else fails. Okay my crafty friends. Let’s see if we can come to the aid of a fellow in need. 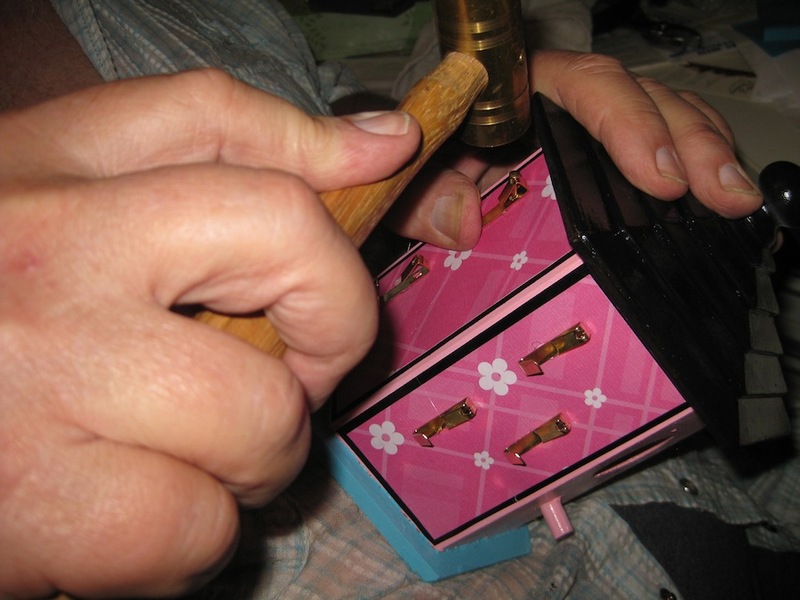 A “One of a Kind” jewelry organizer for my granddaughter. One of my sweet granddaughters had a birthday in April. I’m so behind in my crafting due to having to go back out on the road. We were home for four days and I made this a priority. 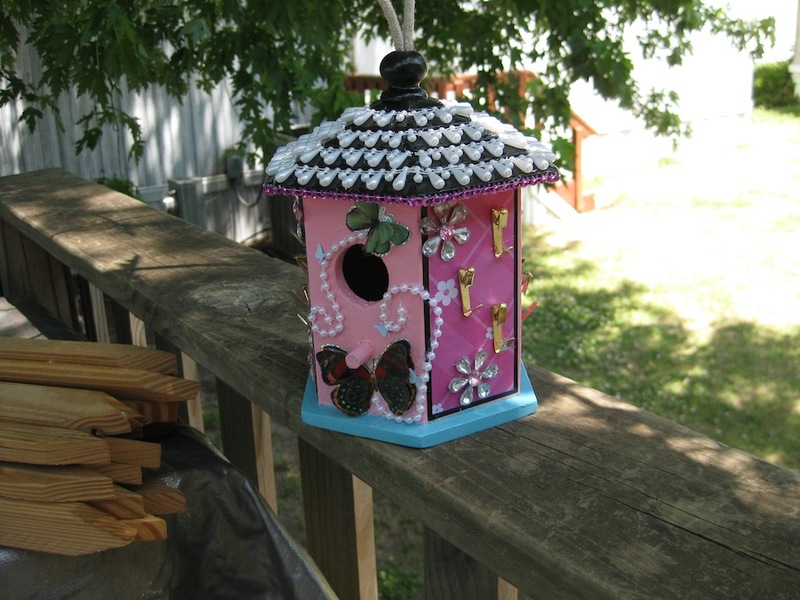 The birdhouse was purchased from JoAnn Fabric and Craft for $6.99. Also purchased at JoAnns were the picture hangers at $1.04 a set of 7 of which I purchased two sets. There was a huge sale on scrapbook paper so I bought a pad of “All Girl Stack” by Darice. Regularly $14.99 and I paid $8.99 for it. I like that kind of a bargain. Paint is from my stash. The black and turquoise acrylic paints are my most recent purchases. The pink paint is some I’ve had since – can you believe it – 1998!. The butterfly stickers were a purchase last winter from the Dollar Tree store and the cost was just that – $1 for a set of about 10 stickers in various sizes. The pearls are from my stash that have been hanging around for several years mostly unused and unloved. The pink rhinestones and the crystal flowers were also a purchase during the winter from Michaels and they were $1 per package and/or spool. I roped Joe into contributing to this project 😀 He lent his tool expertise. I have a tendency to bend nails into pretzels when I whack them with a hammer. He always knows how to handle this job so I left it to better skilled hands than mine. Well…if you want to see the project from start to finish you can watch the video I made of the process. So…until next time – bye for now. 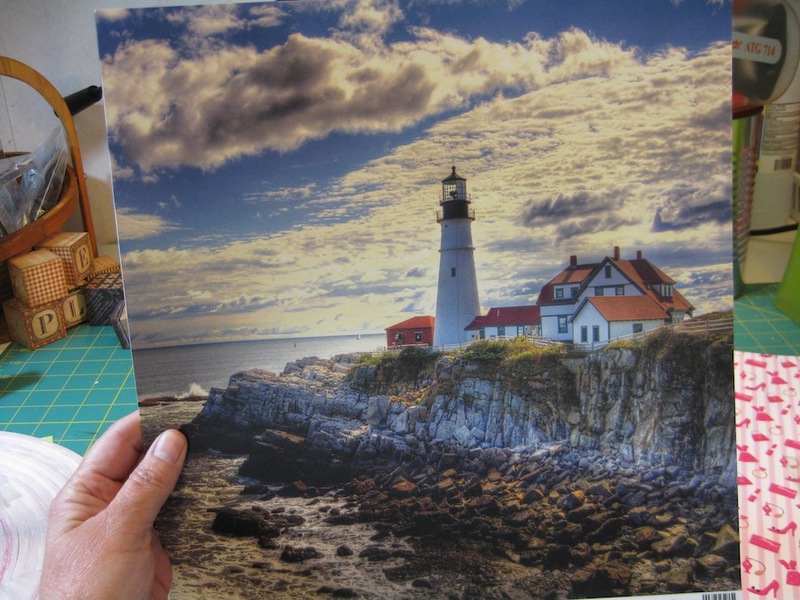 Have you heard of “Scrap Your Trip” online scrapbook store? 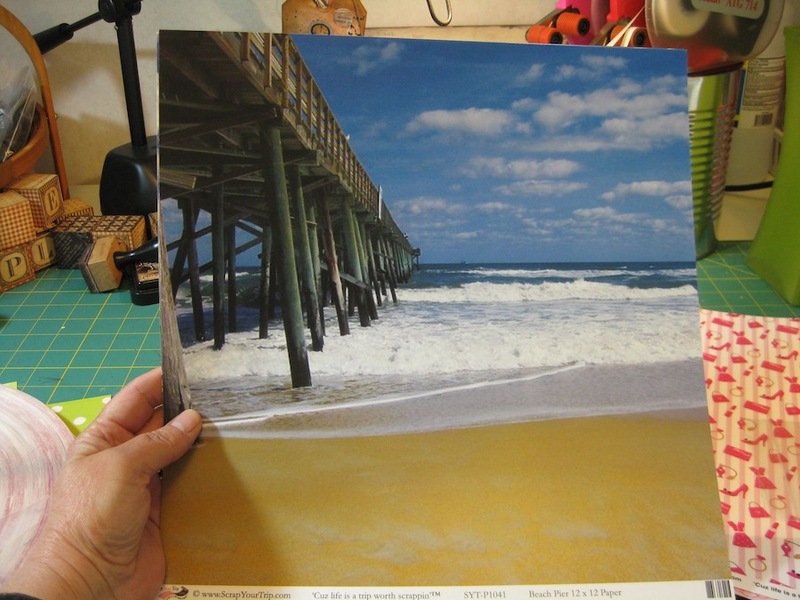 If you are on the look out for special papers and die cuts then take a look at Scrap Your Trip. No, they are not paying me to promote them. I’m going to show you a very small “Haul” of my purchases. Speaking of “Hauls”, and I did….I don’t video them. Personally, it is because I always wonder what the people actually make with the things they purchase, AND if they ever do make anything with all the stuff they buy or does it get hoarded away. Instead of teasing us with the things they bought, how about featuring a few items from the haul video that have been transformed into delightful creations. I’d watch those videos all day long! I purchased some items from Scrap Your Trip a few years back when I made some Post-It-Note holders. I made a lot of the holders for a friend of ours to give out as gifts for his friends and family. 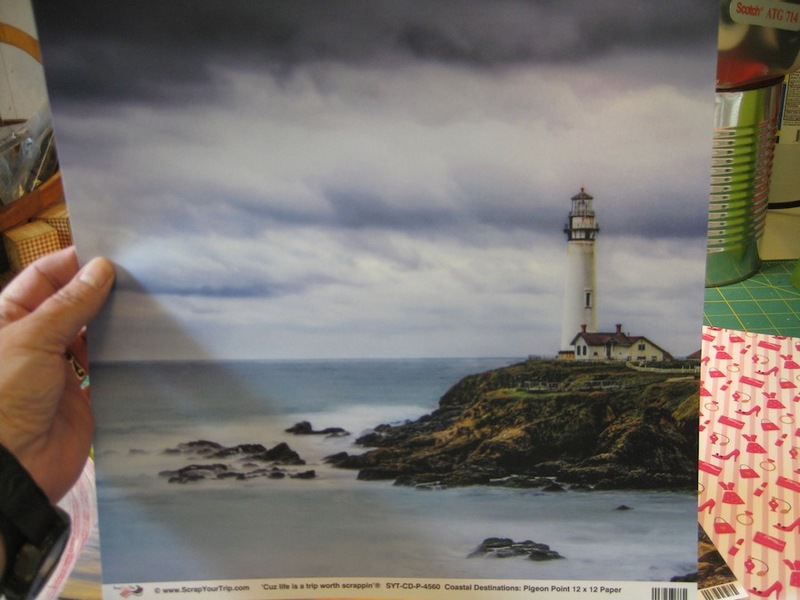 I was in search of papers featuring Lighthouses. My daughter-in-law was the second birthday person in April on my list. Tiffany was the first and I made her Mardi Gras mask a few days ago. It was pretty easy making Tiffany’s since she always makes sure to let everyone know she is in love with New Orleans. Brenda, my daughter-in-law, is a quiet person and sometimes hard to get information out of. Once I found out she collected Lighthouse things you can bet if I found something that resembled a Lighthouse I got it for her. For her late birthday present I am making her a journal or a notebook. 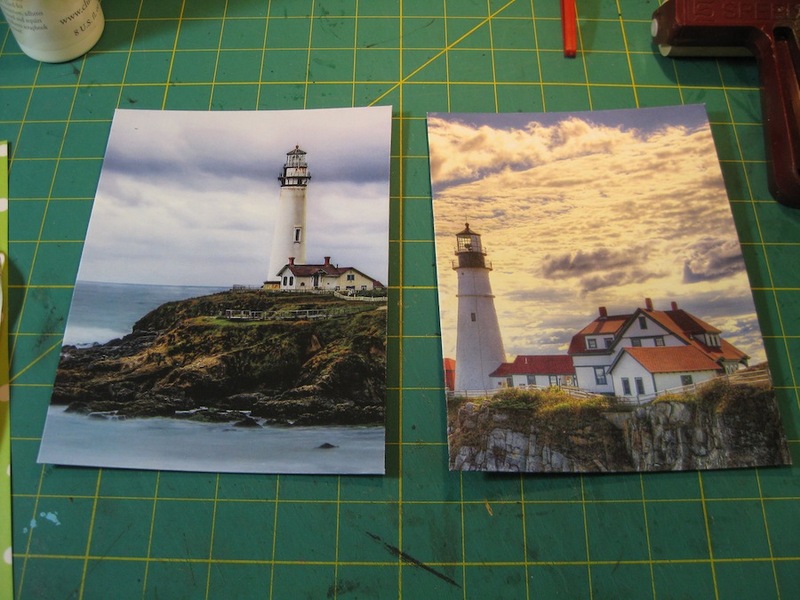 These are the papers I purchased from Scrap Your Trip. These papers are all 12 x 12. They look like photographs. It is a shame I will have to cut them up. 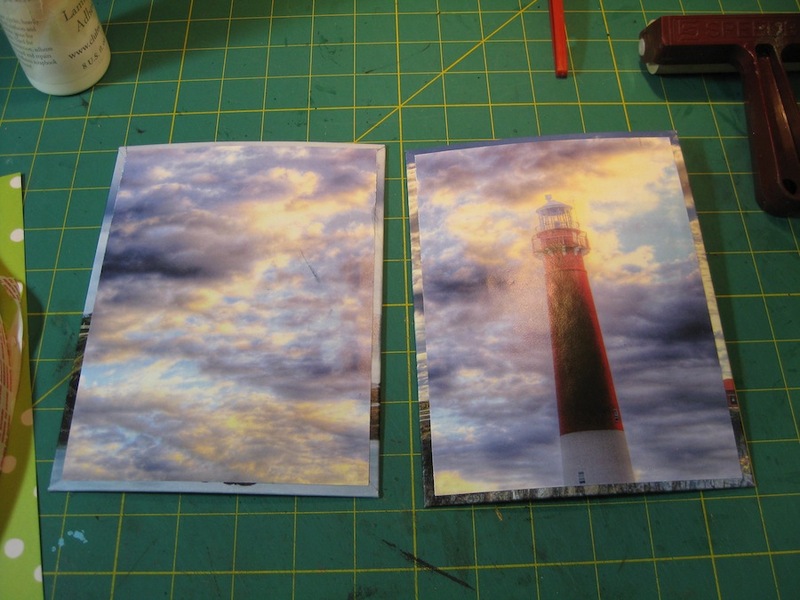 The images were such that I could use nearly the entire Lighthouse on the front and back covers of Brenda’s journal. 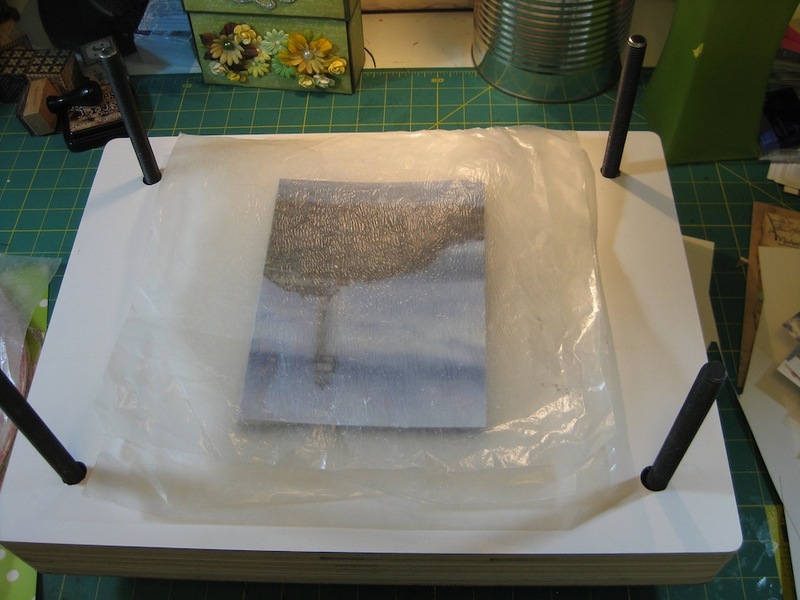 In the photo below…the left will be the front of the book and the right will be the back of the book. I was able to make use of each of the images and not lose too much of the beautiful scenes. 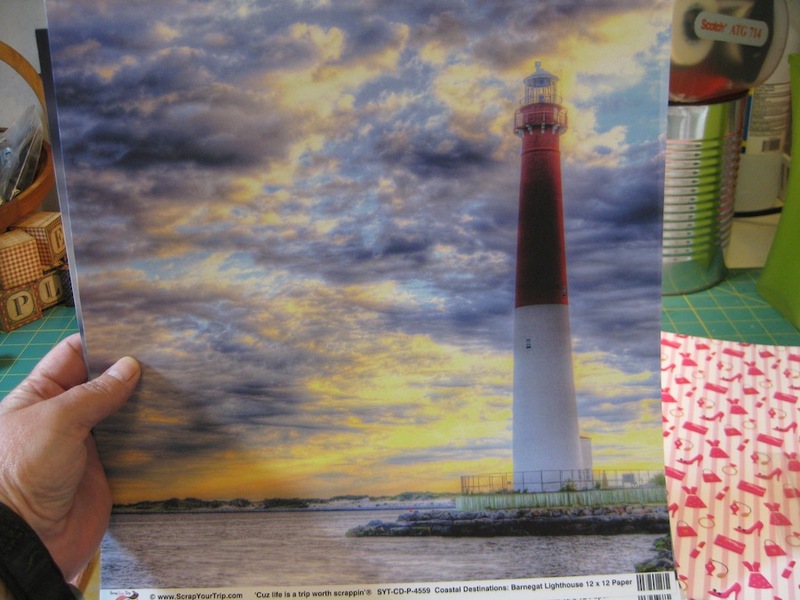 I chose to use the sky and the upper part of the tallest Lighthouse for the inside covers. 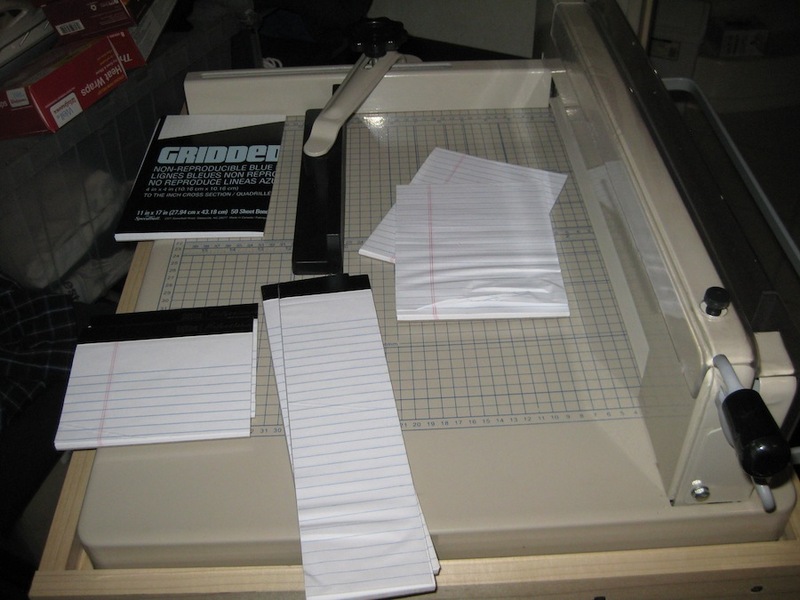 I got to use my industrial paper cutter on the new stand Joe made for me. It worked really well in cutting up two pads of lined paper. 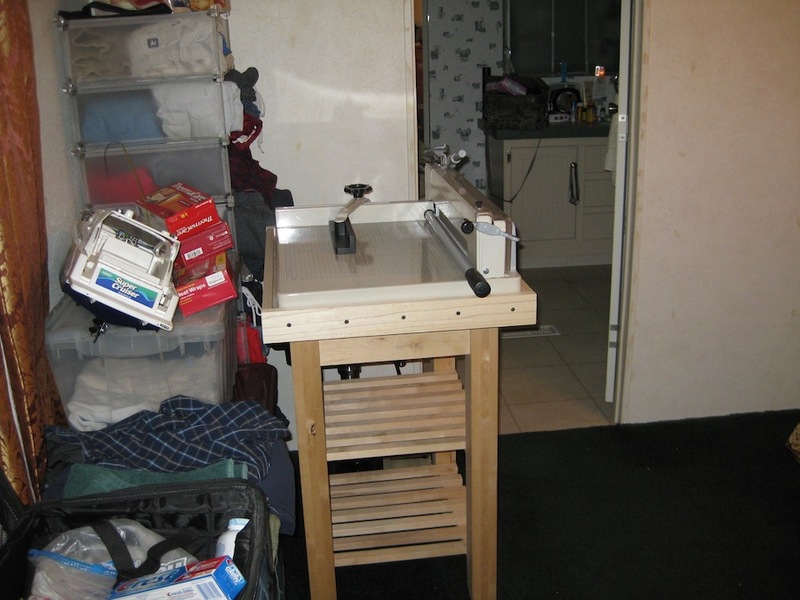 The poor cutter is relegated to our bedroom since there is no other place in the house to keep it. 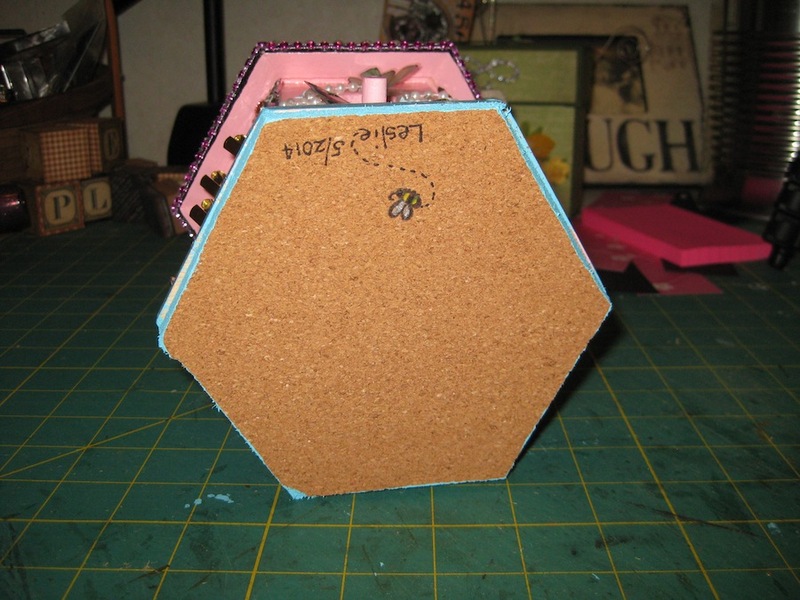 The chipboard was cut using the industrial paper cutter as well. 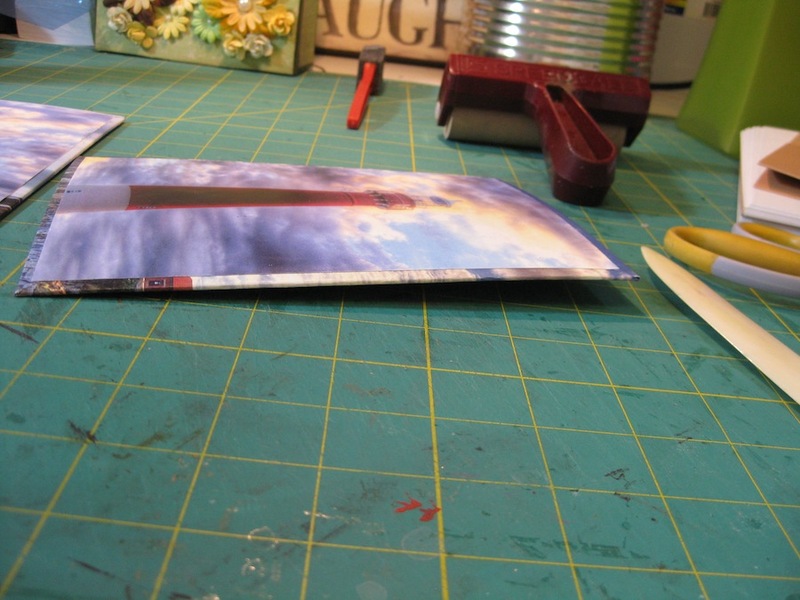 After I glued on the Lighthouse papers the chipboard warped from the glue. I have some work to do today on Brenda’s birthday present. Get her journal put together. Punched and bound. I hope to have this in the mail later today or tomorrow. We are leaving town again to get trucks out of Laredo, Texas going to Dallas, Texas. We will be making two trips for five trucks. Then we will be off to other parts of the US for a stint out for about a month. I better get in my room and off the computer! Hopefully I can show the completed project before we have to leave.